Start of the 1974 Raglan Enduro. Ready to go are #1 Steve Gilbert, #2? ?, #3 Dave Judson, #4 Dave Price, #5 Jeff Cross. 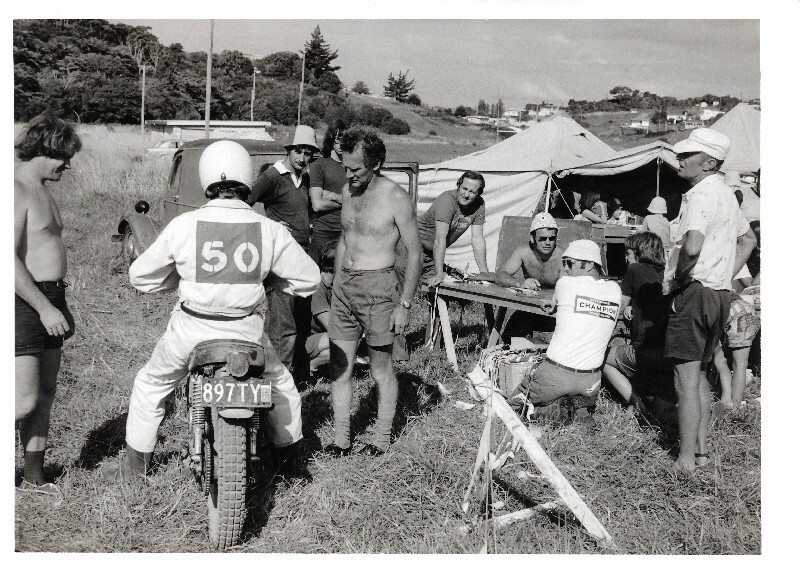 To the best of our knowledge NZ's first proper Enduro was run by the Hamilton MCC at Raglan on January 20th 1974. Organiser of that inaugural event, Roy Long has raided the back of his shed and unearhted a load of photos from 1974, almost none of them previously published. According to the NZ Motorcycle News report of the event Raglan was the first American type time-card enduro to be held in NZ. The entry fee was a hefty three dollars, with entries limited to 80 riders. Ever the innovators the HMCC issued each rider with a Raglan #1 t shirt, which explains why we have seen so many aired over the years. At first look the shirts seem to have shrunk badly, but going back to these photos suggests it's some owners who have grown. 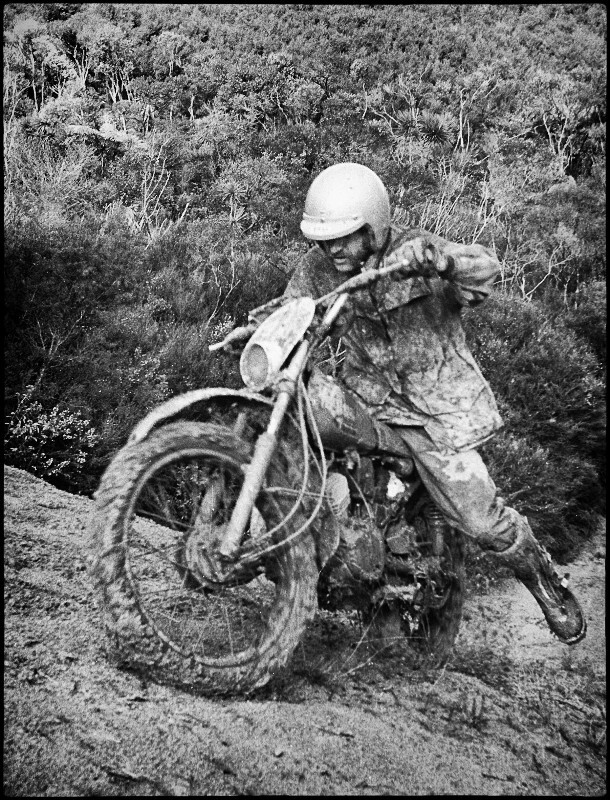 1974 Raglan Enduro organiser and Hamilton MCC stalwart Roy Long tackles a muddy hill on his Yamaha DT175. The 1974 Raglan course included gravel roads, bush tracks and farmland, as part of an 80km loop from Raglan around Mt Karioi. The course was repeated three times with a huge total distance of 240km and about eight hours riding time. Looking at the photos shows how this event was at the transition from days of Spanish trials bikes, British Iron and trials tyres to slicker Japanese trail bikes. From 1974 it would be the modified trail bike that would dominate NZ enduros until the advent of the specialist PE and IT enduros 1979. Raglan Enduro went on to become one of NZ's iconic events, a staple part of the NZ Championships through to the late eighties. Sign on and scrutineering 1974. Charlie Hedges and Trevor Rose presiding.